From the terrible conditions of main highways, many people easily conclude that Mr. Karzai has done nothing tangible in the past 4 years. 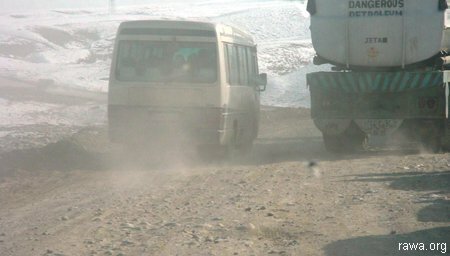 While thousands of people travel through this highway everyday and is main line of supply to Kabul and some other cities, but it has not been reconstructed yet. 7-hour travel on this road is a real torture. In 1994 over 480 million $ has been given to Afghanistan by donor countries but much of it is being grabbed by warlords who are in high positions in the government.